Estelle Nehring is styled by Samuel Francois in ‘Amazone’, lensed by Hans Feurer for Numéro France March 2019. Model Estelle Nehring is styled by Samuel Francois in ‘Amazone’, lensed by Hans Feurer for Numéro France March 2019. We’re no authority on the relationship that women who read French magazines like Numéro have with horses, compared to American women — but common sense brings to mind a few past AOC articles. .
Abigail Adams begged her husband John to “remember the women”, when the Founding Fathers were drafting the Constitution. Alas, no rights for America’s women were written into the Constitution. Like slaves, Indians and animals, women followed the marching orders of the Founding Fathers, which put men in charge of everything. It’s not the case that that French women haven’t sufferred their own degradations at the hands of the patriarchy. Still, the fact is that Adam’s first biblical wife Lilith resides in a MFM bas-relief sculpture of Lilith+Adam+Eve on that Catholic bastion of male power in Paris — Notre Dame Cathedral. In fact, the sculptures by Othon Friesz tell the story of the Biblical ‘Temptation of Adam and Eve’ and downfall of Lilith — one of the original feminist women and a true goddess in earlier times in human history. The Biblical story of Eve’s downfall, succumbing to the the temptation of Lilith — did you think Satan is a HE? — haunts women to this day.. Satan is a ‘she’ and today’s right-wing Republicans remind us daily of our Satan-status. Living within this American reality prompted history’s daring women to become cowgirls. As Kounila Keo described in her 2011 recounting of the fall of matriarchy in Cambodia for the now defunct Constructive Cambodian, American Christian women — as opposed to Native American women — had few strong-women role models. Unlike America, for example, and its “founding fathers,” a precedent is already in place for female leadership in Cambodia. Queen Lieu Ye, the country’s original monarch, who ruled over a group of Khmer tribes, is known to have formed the Kingdom called Funan, or Nokor Phnom, setting a standard for women as premieres, not only in the family, but in society as a whole. In the memory of Queen Lieu Ye’s matriarchy, the word mae (mother) continues to connote the honour of the female-being and, more importantly, traits of ‘greatness, leadership, or of being the essential element’. For example, you still have gender neutral words such as mae-torp (military commander), mae-khum (chief of commune), referring to anyone who holds these positions of power. The back-in-the-day multi-genre singer was a writer of more than two dozen books, an actress in over 30 films and television shows, writer of 200 songs, including “Happy Trails”, and wife to the equally-famous Roy Rogers. They were partners on and off screen for 50 years as they raised several children. If you think this is an All-American family, I have news for you. My eyes nearly rolled back into my head, reading just now that Dale Evans was the American icon Roy Rogers’ THIRD wife. Having been raised Catholic and taught that divorce would have me burning forevermore in Hell with Lilith at my side, who knew that Roy Rogers believed in divorce. 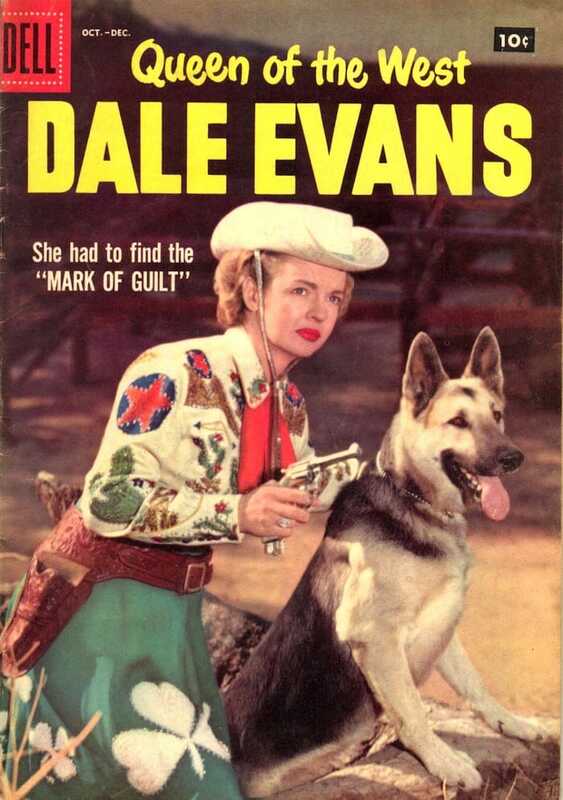 Oh dear me, so did Dale Evans! She had THREE earlier husbands — and still America loved her. Did they know these facts about her tawdry past? Perhaps not. Or perhaps she could shoot straight and packed a pistol, giving her a pass with today’s morality-infused NRA. Lordy, thank goddess there weren’t any tapes or this duo would have been impeached. Wait, there is more. Dale Evans eloped at age 14 and married Thomas F. Fox, 15, as husband #1. They had a son, and her hubby left Evans — then known as Lucille Wood Smith before she became Frances Octavia Smith before she became Dale Evans — high, dry and alone in Memphis. The smart, enterprising Smith correctly calculated that Bible-toting, American Christians would say that her mess of a life was entirely her own fault, so she made her son Thomas Jr. her younger brother. Voila, as the French say! ! The rest is history, and a reminder that cowgirls really can make it big in America. Wait up, we are not finished. There’s an epic anthropological, social science article in the current issue of research journal ‘Nature’. Facts around the rise of monotheism have been a chicken and egg story, about which came first. God or Civilization choosing white Christians as leaders to the Promised Land. Success then and now has everything to do with cowgirls, women politicians, Lilith as Satan, and countless other misogynist stereotypes — although after ‘women are the devil and responsible for the downfall of civilization’, what’s really left?. GOD the Father and Angel Guercino Giovan Francesco Barbieri via Wikimedia Commons. Besides the obvious problem that Hillary Clinton never met a horse that she wanted to ride — at least in public — Republicans assured us that Lilith in the form of Satan resides in Hillary’s dark soul. Hold tight, Hillary, because a new calvary is coming and in a few years, redemption may be yours. Scientists are using supercomputers and a massive new database of world history, known as Seshat (named after the Egyptian goddess of record keeping), to explain a bit of misinterpretation of historical facts around the evolution of modern civilizations. Moralising gods come later than many people thought, well after the sharpest rises in social complexity in world history. In other words, gods who care about whether we are good or bad did not drive the initial rise of civilisations – but came later.